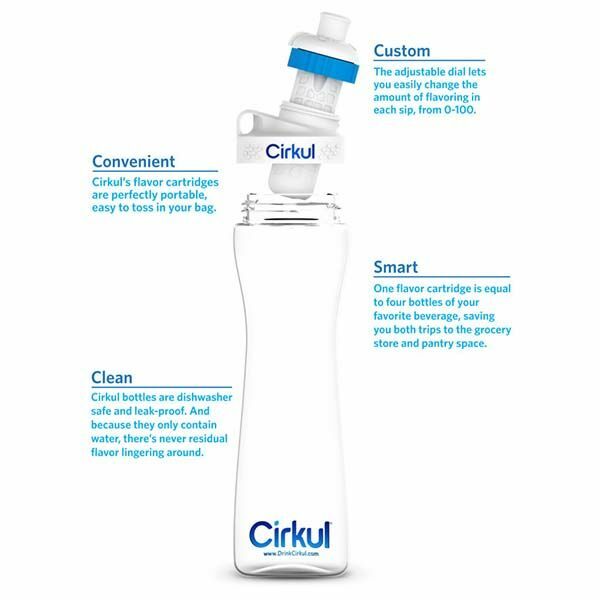 Using replaceable cartridges Cirkul water bottle lets you add your favorite flavor into your water, and an integrated dial allows you to adjust the flavor with ease. Is it an efficient way to keep you hydrated? Let’s keep checking. The Cirkul is an innovative and customizable water bottle that weighs less than 1oz. As shown in the images, the bottle sports a sleek and minimal design defined by its smooth contours and transparent body, and the curved contours let you comfortably hold it in your hand for drinking. Meanwhile, the water bottle is dishwasher safe and leak-proof. The water bottle is designed to make you love drinking water with its unique replaceable cartridges including LifeSip, FitSip and GoSip. The LifeSip contains enriched essential B-vitamins, the FitSip features electrolytes to help you through your most rigorous workouts, and the GoSip cartridges give you caffeinated flavors. Furthermore, the Cirkul also features an integrated dial that allows you to freely adjust the flavor level from 0 to 10 in order to perfectly match your taste. Each Sip has no sugar and zero calories, so the Sips help you prevent sugar-related health problems when you keep hydrated. Moreover, the water bottle can hold 22oz of water, and each cartridge can last around 80oz. The Cirkul has successfully reached its crowdfunding funding goal on Indiegogo. You can pledge $27 to preorder the water bottle with 8 flavor cartridges. It would be shipped in September 2017 (estimated).